Before I tell you about my new experience, I must tell you again how much I love you. I must tell you that, if it weren't for you and your love and prayers for me, I'm not sure how I would be. In fact, my mom and I were talking the other day about how sometimes we can just hear Jesus' words of comfort coming through your comments. That's an incredible blessing, ya'll. That is the kind of support that helps me trust God and put my faith in Him. Thank you. Truly, I thank you so much. 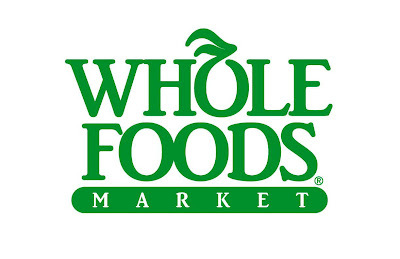 Yesterday, Brian and I made the short drive to Dallas to visit Whole Foods for the first time. I wasn't quite sure what to expect, but I found the store to be much like Central Market. Since I've never really purchased a lot of groceries at Central Market, I can't really compare price, but I can say that Whole Foods was pretty pricey, especially when I'm used to buying the store brands at Wal Mart or my local grocery store. But, I am committed to my health, so price seems a little less important than it used to. Still, I have a hard time paying $9 for a small container of almond butter (I am no longer eating peanut butter). To say the least, it was a wonderful experience. We spent about 2 hours in the store, meandering up and down the aisles, looking for things that are free of all the things that I've cut out of my diet, which is almost everything. In addition, we went ahead and took the plunge to replace all of our cleaning products and toiletry items with more natural versions. I don't know that any of this will do any good, but I do know that these less harsh varieties are soothing to the skin. In other news, I am headed back to work tomorrow. I do think that it will be a hard day, physically, but I'm ready to return to some normalcy. My body is definitely tired. I wouldn't recommend 2 surgeries in 13 days unless it's an absolute necessity. This has been hard on the 'ole body. But, mostly I'm feeling good. I feel that I'm getting stronger and stronger each day. I feel the healing power of God upon me, and that is a powerful thing. - Total and complete healing. Right now, my body is a bit worn down. Please pray for renewed strength and endurance. -TREATMENT DECISIONS - Please continue to pray that the Lord would make treatment decisions for us, that He would guide us to the very best treatment plan, and that we would rest peacefully knowing that this plan is from Him. Pray that we would be guarded from making any wrong or harmful decisions. -My weight. They say to never talk about a girl's weight, but lets talk about my weight. Since I've totally renewed my way of eating, I've consistently been dropping weight. Please pray that my body would hold at a healthy weight. I'm having a bit of trouble with this. My doctor has ordered me to gain 8lbs. It's just hard to get enough calories when you are eating totally pure and natural food. -The Lord's work in us - My prayer has continually been that God would allow me to boast in Him, not in me. This is not about me. During my time with the Lord on Friday, I prayed, "God, please just guide me to your truths for my life this morning." Quickly, I was led to Psalm 118. Let me share verse 17 with you, "I will not die but live, and will proclaim what the LORD has done." I'm claiming this for my life! I'm being totally serious...I love almond butter. I think the bulk variety is a little cheaper at Central Market. At least it was the last time I bought it. Not sure if it's in your diet, but I love it with a little agave nectar on top. We're still praying as always. I love how God works! Psalm 118:17 is one of my life verses and I have also prayed it for you. I believe that God has great things in store for you because of this and that you will be able to proclaim what God has done. I love Whole Foods..I agree, a bit pricey. I love their granola and dried banana chips! I forgot to comment on Psalm 118:17. I love it! This morning, we church hopped to the service @ Grace. One thing he said in the sermon is, "God is a purposeful creator of life." I immediately thought of--and prayed for--you. LOVE the verse! Awesome! God is so involved in what is going on! Praying for you! AMEN!! I am so proud of you for switching the cleaning products, household and personal too. You Go Girl! I was thinking about you while I was driving last night and took some time to pray. I prayed for a lot of the things on your list. I still think it is so neat that I feel led to pray for things that God knows you need. I will praying for you to have strength and energy at work tomorrow! My name is Joanne Williams and I am Leslie Bunt's grandmother. She has shared with me the things that are going on with you. I want you to know I will be lifting you up in prayer daily. I know what prayers can do for you as we lost our youngest daughter in October to MSA and if it had not been for the prayer warriors I would have not have made it. God has an ultimate plan for all of this and HE will be honored. Amanda's favorite Psalm was 91. I live in Dallas now so if you guys ever need anything when you're hear, please let me know! Do you have a calorie counter program to help you meet a recommended amount of daily calories? I've found it to be extremely helpful. The program sparkpeople is free online and has an app. Isaiah 40:31-They that wait on the Lord shall renew their strength. They will soar on the wings of eagles. They will run and not grow weary. They will walk and not faint. You are truly waiting upon the Lord. I pray for your strength and stamina and will look forward to seeing you today. (one of) my favorite treat(s) from Whole Foods: Hummus! they make it there, and it is so, so, good. The Omnivore's Dilemma and In Defense of Food by Michael Pollan. Are you updating your bath/body products to be pure and natural as well? I will be praying throughout the day for you as you return to work. You are a stronger person than me to begin with to be able to face a roomful of elementary children! I want to share a verse with you today from my studies: "Not that we are adequate in ourselves to consider anything as coming from ourselves, but our adequacy is from God." 2 Cor. 3:5 Isn't it comforting to know that it's all about Him, not us? Loving thoughts to you and Brian. I prayed for you this morning as I read this while I was holding my 6 week old son. I looked at him as I did thinking that if God can create this miracle of a child, he can do anything! I don't know if you can have these things, but healthy fats like olive oil, avacado, and almonds are great ways to keep some weight on in a healthy manner. You have so much support...may it continue to grow! I can't believe you are back at work today! May His strength be yours, Praying for you now as you face those little charmers! Thanks for your continual positive outlook and giving God glory. I'm intrigued by your new diet/food regimen--how did you decide what to cut/keep? Sounds like a much healthier way to eat. I wish organic/natural foods were a bit cheaper! Praying for clarity and healing today. I love perusing the aisles at Whole Foods. But, I never buy much because it is expensive. Hope your day back at school goes well. I will be praying that you get stronger each day and for all your concerns on treatments. I showed your blog this weekend to a friend here in the Midwest and told him these are the wonderful people that I have been telling him about and how you are such a strong woman of faith. I feel like I know you all through the photos and blogs the last two years....the love of God connects people over miles. Know that here in Iowa I will continue to pray for your entire family. I have to agree with Mark and April Skinner's book recommendations up there. Check them out! We always call Whole Foods "Whole Paycheck," but after reading those books you will find that we ARE paying the price for cheap food, even if we don't see it at the cash register...in our health, in our gas prices, etc. And please say hello to Central Market for me. I miss it so. I'm a new follower! I was "introduced" to your story because my husband works at Clarkston as counselor, then I saw a long-time friend join your Facebook group. I saw you at the Komen race (I was the one with the pink wig). I had no idea of your latest diagnosis. I am so sorry about this! Your faith in God is obvious and such an encouragement to many. I've gone down this same road, being dx'd 8-6-09 with breast cancer (6 of 16 lymph nodes). Surgery, chemo, radiation. yeah. I'm not gonna bore you with the details but if you ever want a shoulder, I have a big one. I also did a blog on here - great idea, huh? I hated telling "the story" a hundred times. Have a blessed day! Praying for you! Hoping you have a great day back - I am sure they missed you while you were out. Wishing you more and more strength every day! And have someone make you some homemade icecream to help with that weight! I love Whole Foods, too! One of my favorite treats is their fruit popsicles they have in their cold box near the register in the summer. I buy our natural cleaning products at Wal-Mart or Targer because they are cheaper. I will continue to pray for you and your family! I hope that your first day back went smoothly. As soon as you get home you need to set your feet up for a little while and eat a healthy snack. Praying that the Lord will continue to strengthen and heal you. I have been praying today for your day back to work. I am hoping that you had favor with the children and that you had a supernatural inner strength and joy while teaching them. I'm confident the Lord is using you greatly in their lives every day you're with them. That is SOOO great. I don't think you read my blog, but I post a lot about my love for Whole Foods and the natural things that are there. I LOVE Central Market, but we don't have one in Tulsa, so I go to Whole Foods. I try to shop as many of the Whole Foods sales as possible, which helps some with the cost. But yea, I understand, what's more important than your health? It seems like a good thing to be spending your money on. I'd be interested to know what brand of hygiene/cleaning stuff you chose for various things. Or if you are just looking for things free of parabens/phalthates, etc. I hope you share more!